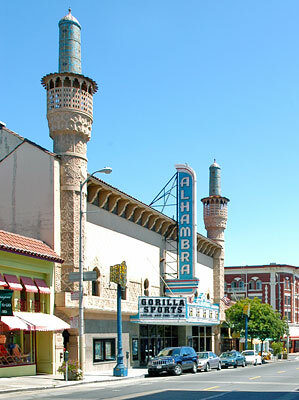 The Alhambra Theater, built of reinforced concrete with unprotected steel trusses, was designed by Miller & Pflueger in the Moorish Revival style which became popular after the 1915 Panama-California Exposition in San Diego and quickly replaced the Mission Revival style. Timothy Pflueger derived the flamboyant ornamentation from Mexican sources which, in turn, had been derived from Spanish sources. The Castro Theater and Mission High School are two other examples of this style. In the 1920s, movie palaces created fantasy environments to match the movies on screen. The Alhambra's Moorish castle decor was part of a trend to build theaters that conjured romantic, far away places: Mayan temples. Oriental palaces, ancient Egyptian tombs. Serving Cow Hollow, Russian Hill and surrounding neighborhoods, the Alhambra Theater provided an alternative the larger, swankier movie theaters on Market Street while still offering its patrons fantasy and elegance. Movies remained the number one source of entertainment throughout the Depression and Word War II, but during the post-war era, television caused attendance to diminish. In the mid-fifties, a cinemascope screen replaced the original Alhambra screen and concealed the massive proscenium arch. In 1974, the theater was "twinned" by dividing the auditorium in half with a cinder-block wall and painted plaster board suspended from the ceiling, covering the plaster dome. The "twinning" was an attempt to make up lost profits. When this approach failed, partially because the dome could not be soundproofed, the lessee tried a different method to lure movie-goers back to the theater. ln 1988, they removed the wall that divided the auditorium and carefully restored the theater's elaborate interior. The Alhambra closed as a movie theater on February 22, 1998, and it is now a gym. The interior retains most of its detail and movies are shown on the big screen. Before the Alhambra was constructed in 1926, a Victorian mansion stood on this property. 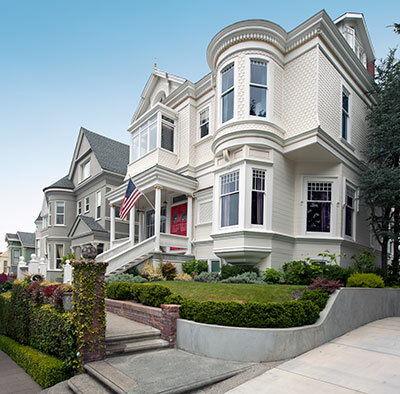 The mansion was moved to 2214 Clay Street in Pacific Heights where it survives in splendor.